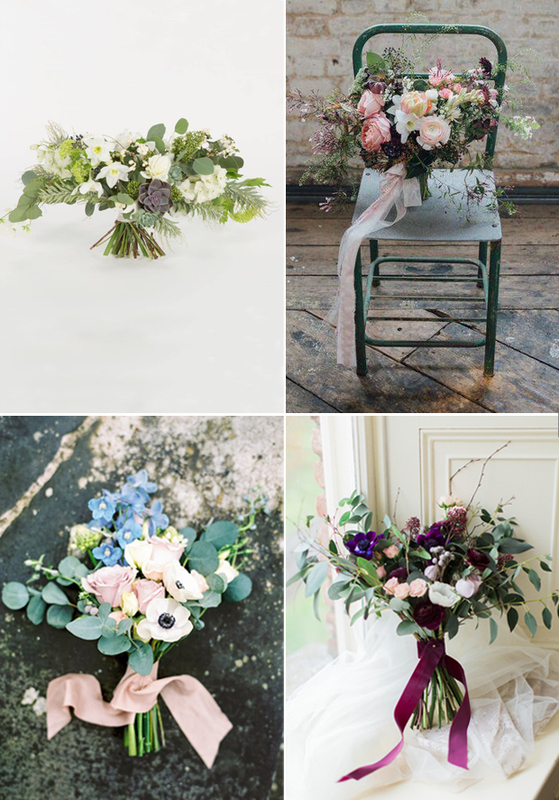 What wedding flower trends are going to be big for the year ahead? Our experts Sylvia from Bella Botanica and Jeanette from Couture de Fleur share their top wedding flower trends for 2016! 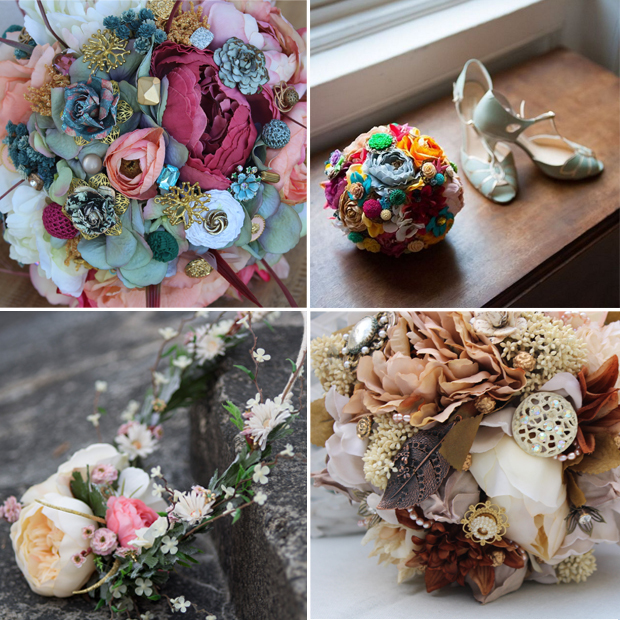 Well 2016 is going to be one florally exciting and colourful year for brides and grooms. As we know the Pantone colour of the year is Rose Quartz and Serenity, so blush will still be evident in florals and trailing ribbons. But this year brides will make braver choices to team these blush colours with berry tones and dark green foliage, to add some depth to their bouquets. 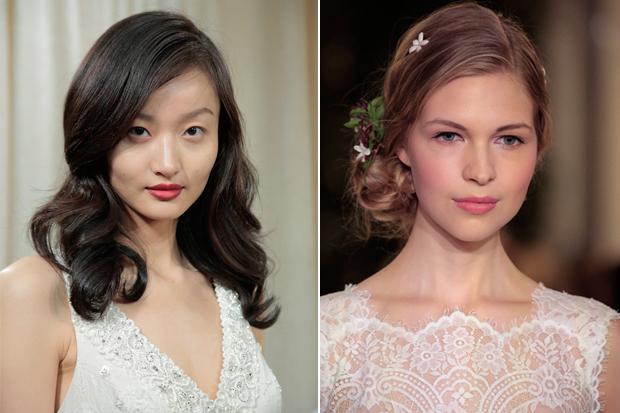 And the trend for billowing trailing ribbons will still adorn bridal bouquets. Not forgetting the grooms, bunches of herbs such as rosemary will be used with unusual florals, tied off with complimentary ribbons. Floral wearables such as cuffs for bridesmaids will be on show. Last year we saw the rise of the beautiful organic free-form bouquets and I am delighted to say these bouquets are here to stay and will be bigger and are more textured. The foliage and florals will fan out horizontally so that all the flowers will have space to shine. Trailing vines, zinnias, scabiosa, cosmos and other seasonal flowers will be taking centre-stage this year, but I am sure the demand for peonies will always be there. Tablescapes of multiple, low free-form designs running along banquet (King’s Tables) are hot right now. Gone are the mason jars and in are copper and muted gold vessels, to showcase these wilder floral beauties. Rustic has taken on a new dimension of chic, elegant florals with the use of foraged items and plenty of foliage, such as ferns and trailing vines, giving that organic woodland aesthetic. Choose your floral designer wisely and put equal thought into choosing this person as you would your photographer. Remember a talented floral designer will set the scene with stunning florals that will create the ambience for your whole day and create memories that will last forever. Here’s to a floraltastic 2016! The most obvious upcoming trend for 2016 wedding florals is definitely, and with respect, the gorgeous Pantone colours of the year Serenity and Rose Quartz. They are both colours of delicate and timeless romance, exactly like in the fairy tales! What’s so unique about these two shades is that they can be teamed with so many other soft colour combinations and even look amazing together too. 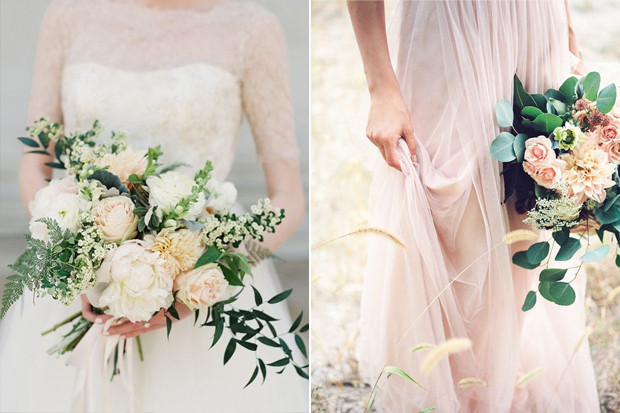 We are noticing a big trend with vivid colours in bridal bouquets, while keeping the bridesmaid florals more neutral. This is a very fun and unique look for any bride who really wants lots of personality and there really are no limits to what you can tastefully achieve with a creative and original approach – an excellent choice for summer and destination weddings. One of our favourite trends set to make a big impact this year is the gorgeous Iced Coffee with lots of emphasis on foliage and antique neutral tones throughout. Beautiful foliage is a fantastic and simple way to express your creative side for any down to earth bride. It is perfect for outdoor weddings and looks just wonderful in any venue accompanied with bohemian floral accents and candles for all the true romantics at heart.